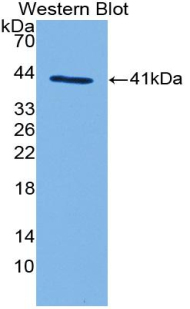 Complement C3a antibody LS-C698210 is a Cy3-conjugated rabbit polyclonal antibody to pig Complement C3a. Validated for WB. Cy3. Also available Unconjugated or conjugated with FITC, Biotin, Biotin, FITC, HRP, PE, APC, Cy7, APC. Complement C3a antibody was raised against recombinant C3a (Ser670-Leu742) expressed in E. coli. Western blot of recombinant Complement C3a.